On our led online store, We are selling Digital Refractometer, Hand-held Refractometer, Hand Held Refractometer, Illumination Hand Held Refractometer, Abbe Refractometer, Bench-top Refractometer, Gem Refractometer, Gemological Refractometer and so on. 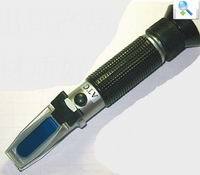 A refractometer is a laboratory or field device for the measurement of an index of refraction (refractometry). The index of refraction is calculated from Snell's law and can be calculated from the composition of the material using the Gladstone–Dale relation. A refractometer is an optical device that, like a hydrometer, measures the specific gravity of your beer or fort. It does so by sampling a small amount of liquid, and looking at its optically. The main advantage over a hydrometer is the small sample size needed – typically only a few drops. If you start with a glass of clear water, you will notice that the water and glass bend the light passing through it in a certain way. The bending of the light by the water is called refraction. Light bends to different degrees as it passes through different substances. This is the same effect that glasses lenses in eyeglasses are based upon – the lenses bend the light allowing glasses to adjust the focus of an image and make it clearer to your eyes. If you add sugar to your glass of water, the light will bend more. The refractometer takes advantage of this effect to measure the amount of bending (refraction) which indicates the amount of sugar in the sample. Most refractometers use a prism and a light source to illuminate the sample. On inexpensive refractometers, you hold the instrument up to a natural light source. More expensive models have internal light sources. 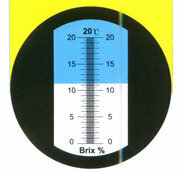 Most brewing refractometers measure samples in Brix, which is a scale used to measure specific gravity primarily by wine makers. Some also use a Refractive Index (RI) scale. Both the Brix and RI indexes need to be converted to standard specific gravity or Plato scales using a formula, as wort does not have the same reflective properties as plain sugar water. In gemology, a refractometer is used to help identify gem materials by measuring their refractive index. In marine aquarium keeping, a refractometer is used to measure the salinity and specific gravity of the water. •The range of readings (highest to lowest), to make sure it will suit your purpose. 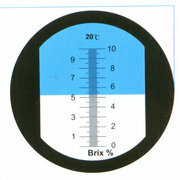 A standard range for home brewers is 0 to 32% Brix. For example, in order to achieve a 13% wine, you'll want to start your wine at a Brix of 23. •The ease with which the refractometer can be read and understood. Some less expensive refractometers are difficult to read, either due to a lack of a focus adjustment, inferior optics, or the eyepiece lacks a rubber seal and will not fit snugly over your eye. •The calibration temperature of the refractometer. The most common calibration temp is 20° C or 68° F. If your sample is not exactly 68° F, you will need to make mathematical corrections to compensate for the temperature difference. Luckily, many modern models of refractometers (like the ones stocked by grapestompers) are sold with ATC (automatic temperature compensation), so you never have to worry about the temperature of your sample. •How easy it is to calibrate. Must you purchase a calibration liquid, or can you calibrate with distilled water? Does it calibrate with a set screw or a dial or knob? •How easy it is to clean. •If it comes with a protective case (they're pretty fragile) and instruction manual. The top 10 most frequently asked questions about our traditional hand-held refractometers. "Why is the scale completely dark?" Unless you have a fluid sample on the measuring surface the inside of the instrument will be dark and you will not see the scale or a shadowline. "Why is the scale completely bright?" If you cannot see the shadowline and the whole scale is illuminated, then the sample you are testing is above the range of the instrument. "How do I turn the light on?" To activate the light on the ViewPoint Illuminator gently press the spot on the label marked "PRESS FOR LIGHT." Remember there are no dumb questions. If the light doesn't work, the battery may be dead. If this is the case, please send the instrument back to us and we can replace the ViewPoint. "How do I know if my instrument is in calibration?" Most instruments have a scale division that is equivalent to water. 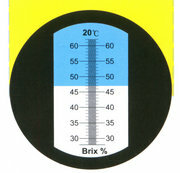 in the case of a Brix refractometer, it is 0.0 Brix, and on the Glycol & Battery Tester, it is +32 degrees. This is the reading you should get when testing water at room temperature. If the reading for water does not equal one of the above values, then you need to recalibrate your instrument. "I hear a rattle inside whenever I shake it." Then don't shake it - just kidding. A rattle most likely means that one of the internal optical components came loose inside. This is usually caused by dropping the instrument. Please send the instrument to our repair department. There is nothing you can do in the field to repair it. In the future remember that this is a precision optical instrument. Although we try to make refractometers as rugged as we can, please try to handle them as you would a pair of binoculars or a camera. "How do I know what instrument I need?" If you are uncertain about which model refractometer you need to test a particular fluid, just call us. We more than likely have experience measuring that fluid. If we can't help you over the phone, we will happily test your fluid in our laboratory FOR FREE to determine which refractometer is best for your needs. "Can I get a certified calibration?" We have a dedicated laboratory and trained staff that will happily test your refractometer and issue a certificate of calibration traceable to NIST. "How do I replace my ViewPoint Illuminator?" The ViewPoint illuminator has a built-in coin cell battery with a ten-year shelf life. It is designed for between 3,000-5,000 fifteen-second uses. In the event the battery dies, just send your entire instrument to MISCO, and we will replace the ViewPoint for you. You may also order a replacement online and change it yourself. Do not try to disassemble the ViewPoint, there are no user serviceable parts inside. "What is the difference between freezepoint and burst point?" Freezepoint is the point that the first ice crystals form in the absence of supercooling. Burst point is the point that the solution freezes solid and bursts the vessel containing it. The burst point is usually 30-50 degrees colder than the freezepoint. Our Glycol & Battery Tester reads the freezepoint of both ethylene and propylene glycol solutions. If you need to know the burst point, take a reading on the Glycol & Battery Tester and use a chart (available from your antifreeze supplier) to cross-reference freezepoint to burst point or percent concentration. "I need to know the percent volume of my glycol?" To ascertain the percent concentration of glycol in a system, obtain a chart of physical properties from your glycol supplier. Take a reading with the Glycol & Battery Tester and cross reference the freezepoint reading to the percent volume column on the chart. The refractometer will power off automatically after three minutes of inactivity. To manually shut off the instrument, hold the ON/CLEAR button down for 3-5 seconds. "How do I change the scales?" Pressing the SELECT button will cycle through all the possible scale choices on the instrument. If you want to permanently change the instrument scales, you may send it back to us and we will be happy to reprogram it for you for a slight charge. "Why does my instrument read [BRIGHT +]?" A reading of [ BRIGHT + ] indicates the optical sensor is being overpowered by strong ambient light. If this happens, shade the sensor or move to a less brightly lit area and repeat the measurement. "Why does my instrument read [TEMP]?" A reading of [ TEMP ] indicates the fluid or instrument temperature is above or below the range of the instrument. "Why does my instrument read [RANGE +/-]?" A reading of [ RANGE +/- ] indicates that the measurement is above or below the range of the current scale. If the instrument periodically reads [RANGE -], make sure you haven't trapped a small bubble in the sensing area. A bubble directly over the sensing area can cause the instrument to display [RANGE -]. "Why does my instrument read [CALIBRTE]?" A reading of [ CALIBRTE ] indicates the instrument needs to be calibrated. The spelling error is intentional since we can only display eight characters. "Why does my instrument read [LOW BATT]?" A reading of [ LOW BATT ] indicates the battery needs to be replaced. Make sure you observe the battery polarity when changing the battery. "How often should I calibrate?" It is recommended that the instrument be calibrated at least once a day, prior to performing any test requiring the highest precision, or when moving between environments with extreme changes in ambient temperature. "Why won't it turn on?" If your instrument won't power on, check the battery polarity. If the polarity is correct and the instrument will still not power on, change the battery. Refractometer, 0~10% Brix, 0~20% Brix, 0~32 Brix%, 28-62% Brix Cutting Liquid refractometers work for a variety of applications including: food and beverage, chemical, pharmaceutical, and industrial cutting fluids These refractometers are at home in the laboratory, in the factory, or in the field. Material: Copper chromeplate and ABS body, Metal meterial of screw, Optic lens. They are are rugged and reliable with exceptional optics.